Nach dem Tod von Tony Moore, dem Mitbegründer der britischen ONG Fight Against Animal Cruelty in Europe (FAACE), führt Mechthild Mench die Tierschutzarbeit von FAACE und Initiative Anti-Corrida weiter. Es bestand ohnehin eine enge Zusammenarbeit. Aktuell wird die Arbeit der tatkräftigen spanischen Tierrechtsorganisation Asociación Nacional para la Protección y el Bienestar de los Animales (ANPBA) finanziell und durch Zuarbeit unterstützt. Ebenso wird die französische ONG Comité Radicalement Anti Corrida (CRAC) unterstützt. Diese Webseite dient zu Informationszwecken über Stierkampf, Fiestas, Rodeo und Ochsenrennen. Spenden werden nicht gesammelt, Daten werden weder erhoben noch weitergegeben oder verkauft. 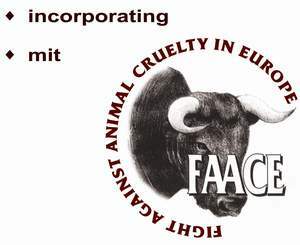 Sadly on the 27th December 2013 Tony Moore, co-founder of Fight Against Animal Cruelty in Europe (FAACE) passed away. In his will he asked his partner Mechthild Mench, founder of Initiative Anti-Corrida to carry on with his and his late wife's, Vicki Moore's, work. In the past they had worked together on several projects anyway and they had met on the campaign's trail. Currently the Spanish ONG Asociación Nacional para la Protección y el Bienestar de los Animales (ANPBA) is financially supported. There is also support for the French ONG Comité Radicalement Anti Corrida (CRAC). This website has been created for information about bullfighting, blood fiestas, rodeo and Bavarian ox-races. It does not ask for donations and does neither collect data nor passes data on.